Bermuda College welcomed three new Honorary Fellows into the Company of Honorary Fellows, with Andrew Banks, Peter Durhager and Dr. Wilbert Warner all formally inducted this weekend. A spokesperson said, “On Saturday, February 9, Bermuda College welcomed three new Honorary Fellows into The Company of Honorary Fellows. “Messrs Andrew Banks; Peter Durhager and Dr. Wilbert Warner were all formally inducted in a weekend ceremony at Coco Reef Hotel. “President of The Company of Honorary Fellows, the Hon. 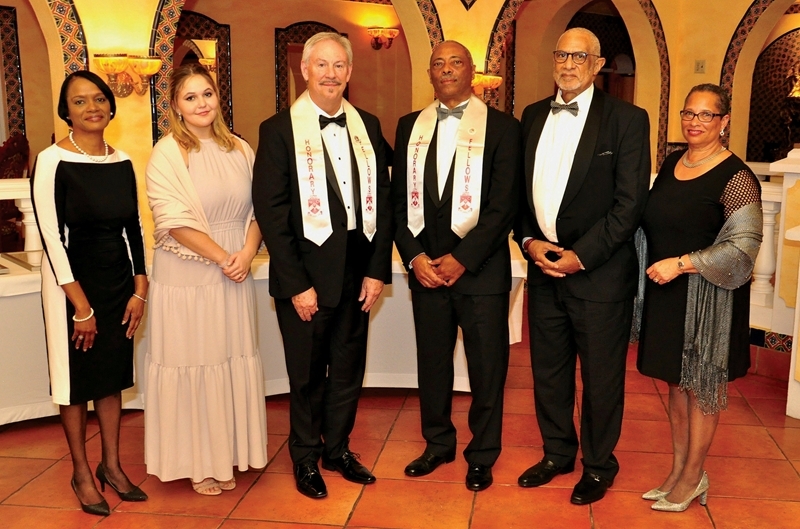 K. H. Randolph Horton expressed delight with the calibre of the three new inductees, and looked forward to the value they would bring to bear on the Company, and to the support they would provide to Bermuda College. “Mr. Banks, a self-described man of “humble origins” is co-founder of the Boston-based equity firm ABRY Partners. The firm acquires and builds media, communications, and entertainment companies, principally in North America, and in doing so, has established a strong reputation for consistently achieving outstanding returns for its investors over its thirty-year history. “ABRY is also invested in a wide array of portfolio companies ranging from movies to magazines, from data centres to digital healthcare, and from satellites to signboards. It is perhaps most popularly known for its film and television production ventures, which include Superman Returns; The Dark Knight; Inception; Steve Jobs; Interstellar; and Spike Lee’s BlackkKlansman; the Transformer films, House of Cards and 22 Jump Street. “Prior to ABRY, Mr. Banks was a partner at the international management consulting firm of Bain & Company. “He received a B.A. from the University of Florida in 1976, where he was elected into the National Honour Society of Phi Beta Kappa. He was a Rhodes Scholar and was graduated from Oxford University with an M.A. Mr. Banks received his J.D. from the Harvard Law School in 1982. He is actively involved with several international charities relating to education and health care in the third world. He is currently a trustee of both Rhodes Trust at Oxford University, and at Johns Hopkins Medicine. Mr. Banks also devotes significant time as an advisor to the boards of several university endowments. “He is Bermudian, and has lived in Bermuda for decades. He is married to Dame Pamela Gordon Banks and they share four children and three grandchildren. “Peter Durhager is an experienced corporate executive and director, entrepreneur and philanthropist. His career has spanned banking and payments, telecommunications and technology, insurance and reinsurance, as well as the energy sector. He is an accomplished entrepreneur and professional manager and is known for his energy and authenticity, broad general management skills and transformational leadership. A firm believer in the philosophy of “giving while living”, he is an active contributor in the communities he lives through philanthropic organisations and social entrepreneurship. “He attended Saltus Grammar School, and after receiving a degree in Philosophy, began his career in banking at Butterfield Bank where he was head of Card Services and Electronic Banking. After leaving Butterfield, he became General Manager of Internet Bermuda [IBL] and was the founding Chairman and CEO of Logic Communications Ltd., and President and CEO of Millennium International Limited, leading technology and telecommunications solutions providers in Bermuda, The Bahamas and Cayman Islands. After selling Logic to KeyTech in 1997, he co-founded and was Vice Chairman, President and Chief Operating Officer of Promisant Holdings Ltd., a global, multi-currency payment processor and merchant acquirer. “In 2003, Mr. Durhager joined the leading property-catastrophe reinsurer RenaissanceRe. He served as Executive Vice President and Chief Administrative Officer of RenaissanceRe Holdings and President of RenaissanceRe Services, where he is widely credited with advancing the maturation of the global enterprise. “Mr. Durhager served alongside three different Premiers of Bermuda as Co-chair of Bermuda First, a public-private think tank from 2009 – 2014. He was also the founding Chairman of the Bermuda Community Foundation from 2013 to 2018, and has served on the Advisory Board of the Centre on Philanthropy. “Mr. Durhager co-led the Bermuda bid to host the 35th America’s Cup. Following his retirement from RenRe, in January 2015, he was appointed Chairman of America’s Cup Bermuda Ltd., the organizing body for the 2017 America’s Cup. The 35th America’s Cup was delivered by Bermuda almost 20% under budget and with a total impact on GDP of over $335 million, proving that large-scale public initiatives can be delivered on-time and on-budget. “Mr. Durhager is currently Chairman of the Board of Ascendant Group Limited, parent company of the Bermuda Electric Light Company, where he has served as a director since 2003. He is also a non-executive director of HarringtonRe Holdings Ltd., a total return reinsurer formed in 2016 by Blackstone and Axis Capital. He is a director of F&G Re Ltd., an affiliate of Fidelity & Guarantee Life Insurance Company. He is also currently a non-executive director of Somers Limited, a publicly listed investment holding company in the financial services sector. “Mr. Durhager is a recipient of the Richard J. Caron Award of Excellence for his efforts in the establishment and funding of The Caron Foundation and Treatment Centers in Bermuda. He is a Justice of the Peace [JP], and has been a member of the Young Presidents Organization [YPO] since 1997. He has been married to Ann for 24 years and they have two daughters, Hannah and Meg. “Dr.Wilbert N. E. Warner is an Internal Medicine Physician who has run a successful practice for 31 years. After completing his high school education at the Berkeley Institute, he went on to the Bermuda Sixth Form Center where he obtained A Levels in Biology and Physics. He was then accepted to McGill University and completed a Bachelors of Science Degree in Cell and Molecular Biology. He continued his studies at the McGill University Medical School obtaining his MD degree in 1981. “Dr. Warner began his medical career in Bermuda at the Health Department as the Police and Prisons Medical Officer under Dr. John Cann. He n returned to Canada to specialise and completed his Internal Medicine Residency at The Montreal General Hospital and The Health Sciences Center, St. John’s, Newfoundland. “In 1987, Dr. Warner returned home and had an immediate impact on the medical care delivered in Bermuda. He modernized and updated ICU protocols and introduced several new treatments, including the then novel arterial thrombolysis treatment in heart attacks. And, in conjunction with the Department of Health, he helped lead the fight against HIV/AIDS, as the primary clinician caring for patients with this disease for many years, improving and extending the life of many of these patients. “Dr. Warner is particularly proud of the establishment, in 1998, of the Multidisciplinary HIV Clinic at King Edward Memorial Hospital [KEMH] and the positive impact that this clinic has had on many lives over the years. He was also instrumental in KEMH obtaining its own Gastrointestinal Endoscopic Unit to readily screen Bermuda’s population for colon cancer, amongst other diagnostic interventions, and in decreasing health costs due to the ability to conduct the procedure on Island. “Dr. Warner has served in many capacities and on a number of committees both within and outside of the hospital. He has served as Chairman of KEMH Department of Medicine; Chief of Medicine; Acting Chief of Staff; Chairman of the Pharmacy and Therapeutics Committee [for over 15 years]; and a previous longstanding member of the ICU Committee. “He has advised numerous Health Ministers on a number of policy matters and was the initial physician appointed to the Bermuda Hospitals Charitable Trust, which guided the Bermuda Hospitals Board through the process of selecting and then delivering the finished product of its recent expansion, the Acute Care Wing. Recognising the importance of supporting the next generation of physicians, Dr. Warner has been a mentor to many younger Bermudian physicians new to Bermuda’s medical fraternity. “Dr. Warner is presently a member of the PALS Board of Directors and a Board member of several other local companies. He served on the Ascendant [BELCO] Board for 18 years and chaired the Corporate Responsibility Subcommittee before retiring in 2017. “Dr. Warner is a quiet philanthropist who supports many organisations on the Island. Dr. Warner is an avid reader particularly of the history genre, and enjoys spending time in his garden. Dr. Warner’s other passion is golf, and he can be found on the golf course Saturday morning, playing with his mates in an attempt to improve his game. On Sunday mornings you will find him attending church service at Crawl Gospel Hall. « Open Airways Survey: Do You Have Asthma?